Now easier to grow than ever, our recommended Girl Scout Cookies Extreme Autoflower seeds are one of the latest additions to our collection of high quality autoflowering seeds. With the same genetic background as our popular conventional feminized variety, combining Durban Poison and OG Kush, together with a fast, automatic flowering Ruderalis, these autoflowering seeds are great for growers of all levels of experience, from beginner to experienced ‘cash-cropper’. Girl Scout Cookies Extreme is renown for its sweet cookie flavor and powerful high, and the same traits and characteristics are carried through into the autoflowering variety together with a minty chocolate aroma. Although the addition of the Ruderalis autoflowering gene has given Girl Scout Cookies Extreme the ability to flower under any photo-period, the strain hasn’t lost any of its flavor or aroma that has made it so popular, since its conception in California several years ago. 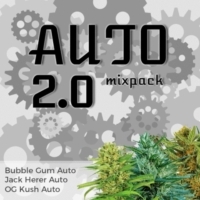 Autoflowering cannabis seeds are much easier to grow than conventional seeds, and a perfect choice for growing outdoors and for beginners. Unlike traditional cannabis seeds which require regular, uninterrupted 12 hour daily amounts of darkness to flower and mature, autoflowering seeds have the ability to flower with few hours of darkness, making them an ideal strain to plant during the Spring and Summer, when the daily sunlight hours are at their longest and most powerful. Completely feminized, these Girl Scout Cookie Extreme Autoflower seeds are devoid of all male chromosomes, ensuring that each seed you buy will germinate, creating a pure female plant. Added with the germination guarantee that comes with all seeds purchased through I Love Growing Marijuana, you can relax in the knowledge every seed you purchase will produce a strong, fast autoflowering cannabis plant, with a bountiful, high quality harvest of dense, tasty buds. In general, autoflowering strains are much quicker to cultivate from seed to harvest, compared to traditional feminized varieties. Conventional cannabis seeds have two distinct stages, vegetative and flowering, with both requiring a set number of weeks to complete, needing a few weeks to grow, and approximately 8 weeks to completely flower. 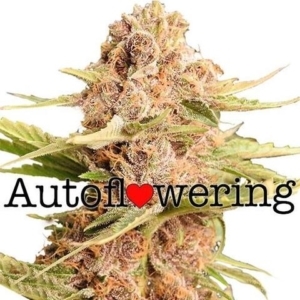 Autoflowering seeds however, grow and flower simultaneously, requiring approximately 8-9 weeks to complete both stages and become fully mature. Girl Scout Cookie Extreme Autoflower seeds are ready to harvest within 7 – 9 weeks of sprouting, regardless of growing indoor or outside. Yields however, can be improved by growing almost all cannabis seeds within an indoor, purpose-built area, and Girl Scout Cookie Extreme Autoflower is no exception. Expect yields of approximately 6 oz per square meter indoors, especially when grown using Screen, or Sea-of-Green methods. While outdoor growers are likely to get that per plant, given good conditions and plenty of space to grow and develop. 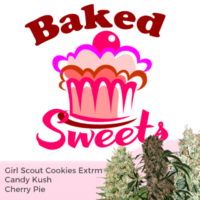 You can buy Girl Scout Cookies Extreme Autoflower seeds in feminized packs of 5, 10 and 20 seeds using a selection of payment methods, including, cash, credit and debit card, bank transfer or even Bitcoin. All orders are shipped directly by I Love Growing Marijuana, one of the world’s leading cannabis and marijuana seed producers and distributors, with free, guaranteed stealth postage and packaging included in the price to all shipments to Europe and the USA. Easy to grow strain with a powerful high and sweet cookie flavor. Fast-acting, powerful high with a long-lasting, euphoric high. THC levels of 21% combine with medium levels of CBD to produce a relaxing night-time smoke. Easy to grow Autoflowering strain with a high natural immunity to many common problems such as mold, root diseases and mites. Medium CBD levels produce a relaxing, energizing high with many medical benefits, including reducing stress, anxiety and depression.